Mahomes wasn't planned to be a part of the family so soon but here he is. So how did Mahomes come to be? 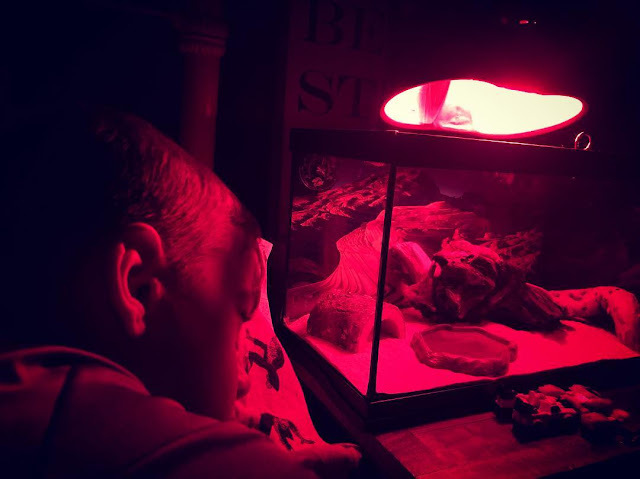 Ever since Logan got his leopard gecko for Christmas from Santa, Kaden, has wanted one too. Now, mind you, Kaden isn't the biggest fan of "animals" especially reptiles. Yet, he took to Max. He wanted to help feed, water, clean its cage & he wanted to hold him. He loved holding him and Justin & I both were so shocked to see him take so easily to Max. But when he asked for one we both said that he would earn one or work for one but that he couldn't just "get one". He understood but was still sad that he'd have to wait. His Christmas present from Santa was in the garage and he couldn't wait to ride it some more. & then the warmer weather came and we were able to get it out a few times and that's when we realized it just wasn't working. We would charge it per the instructions and it would literally run to the stop sign and then they would have to push it back home. Hours of charging for minutes of play. So, I started looking into what we got him, the Vega Viro 2-in-1. I saw that on Target.com there were a number of reviews that weren't good. So I left my own in hopes that someone would reach out to me or leave a number to contact like one of the other reviews. A few days later I went back to check the review and you couldn't even find the item--they had removed it from the website. So I called. Long story short, we ended up taking it back. There wasn't any replacement available but they said that I could bring it and they would give me our money back. Although I knew this is what needed to be done--my heart broke having to do it. He wanted that so badly for Christmas and it was from Santa. And Santa's elves went so far out of their way to track this gift down and get it back to KS in time for Christmas. I'm talking Tucson, AZ to Lenexa, KS. What we will do for our kiddos. Again, though, I knew what we needed to do so I talked to Kaden about it, we had days left until the return policy would lapse. I explained that I was so sorry that his Christmas present from Santa wasn't working and that I had figured out a way we could maybe make it right. What if we took it Target, per Santa's suggestion, and then instead of getting a new one, we could get a gecko for him. His eyes went straight from being filled with sadness to being filled with joy and excitement. He was all for it. So, the following Friday Justin loaded the scooter up and I took it back. I then walked next door and loaded up a gecko and everything we need to give it a home. And a home Kaden has given him. He has taken such great care of Mahomes and just loves getting him out to play with him. I think they'll be best of buds and good news---Mahomes will be around a lot longer than that scooter would have been. Not the way we thought it would shake out but it certainly was meant to be.